The official complement of Star Trek: The Next Generation’s U.S.S. Enterprise-D is a massive 1,014 people including crew and their families. While the series had a big budget for its time and made a game effort to feature a variety of spaces within the ship (and its efforts to do so are arguably part of why the Enterprise-D is so beloved), no television show could reasonably depict that scope. That’s why it’s always been up to dedicated fans to read the ship’s official technical blueprints and imagine what the aquatics lab might have looked like, or how Captain Picard decorated his Captain’s Yacht. Enter the Enterprise 3-D Project, a scale recreation of the ship created in Unreal Engine 4 being built by one supremely dedicated fan. 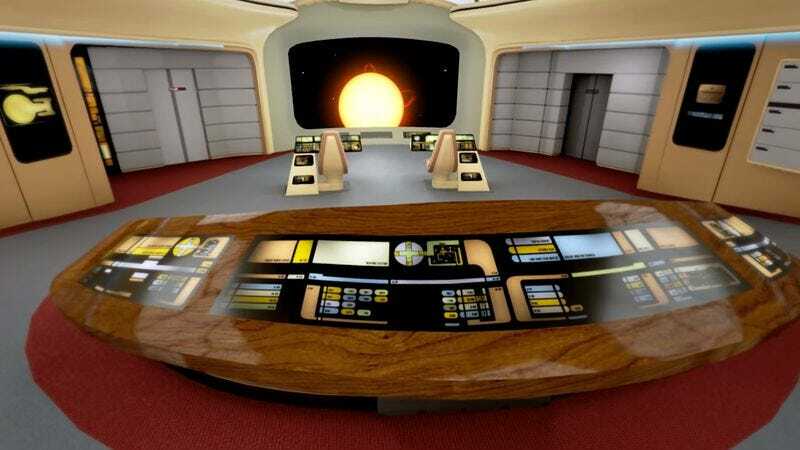 Designer Jason B. recently offered users a brief video tour of his work in progress, a virtual walkthrough of the ship from the massive Shuttlebay 01 (only briefly glimpsed in the series due to budget constraints) through the Ten Forward lounge to the bridge, and to other spaces never shown on the television show. While the video below only covers a small section of the ship, the designer intends to replicate the whole thing from stem-to-stern, optimized for virtual reality through the Oculus Rift. For anyone whose ever dreamed of roaming the decks of the Enterprise, that’s an irresistible proposition. Follow the creator’s progress on his blog.